A person who is bored of chocolate is bored of life, but occasionally everybody's favourite sweet indulgence needs company. A basic chocolate cookies recipe can be taken to another level by the inclusion of a surprise ingredient, whether fruit, nuts or a touch of spice. Experimentation can result in a truly original creation. Before you ring the changes, get your chocolate cookies recipe down to a fine art. Around 250g of flour, the same amount of brown sugar, 200g of butter and 2 eggs form the basic ingredients, with a pinch of baking powder, a drop of vanilla extract and around 100g of high-quality cocoa. The butter and sugar should be creamed before sifting in the flour and cocoa. This is the stage to introduce your additional ingredients. Nuts are an obvious choice for added flavour and crunch. Hazelnuts and peanuts are cookie classics, but, for a more exotic result, consider pecans or macadamias. In autumn, a little softened butternut squash and a hint of cinnamon can create an interesting texture for your cookies. The vegetable content doesn't exactly make it a health food, but it's a step in the right direction. Citrus flavours work well, especially with a dark chocolate cookie. Orange and lime are best. Use a little fresh juice to flavour the dough, and fleck the mixture with the zest of the fruit. Chopped, macerated cherries can give your chocolate cookies a Black Forest gateau makeover. Again this works best in combination with dark chocolate chips that melt over the cherries during the bake. 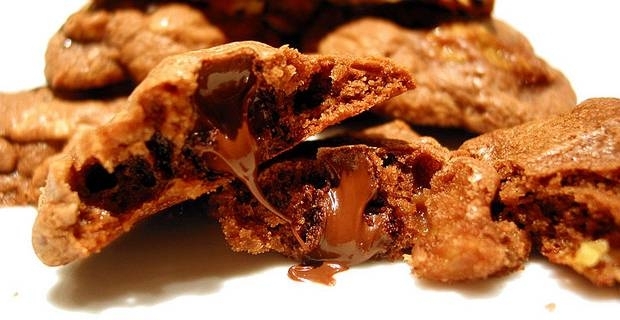 Using additional ingredients in your chocolate cookies recipe may affect the cooking time. Using soft or wet fruit or fruit juice will make the dough moister and increase the cooking time, unless you want a soft-bake cookie. Trial and error will determine the ideal baking time for your new recipes.